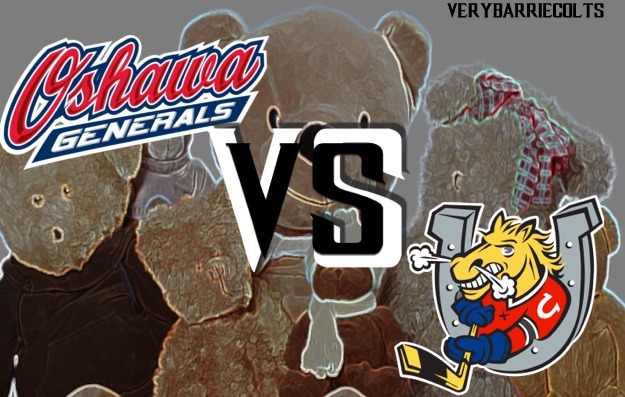 Game Preview: Barrie Colts VS Oshawa Generals on Sportsnet. (Teddy Bear Toss) #OHL - Very Barrie Colts | A website covering the Barrie Colts of the OHL. This afternoon the Barrie Colts (16-9-2-1) host the Oshawa Generals (13-15-2-0) for the final meeting of 4 this regular season. Barrie has won 2 of the 3 meetings, which included a 4-0 shutout in the first game. Oshawa dominated the last match-up 7-3. Today's 3:30 game will be the 3rd and final Colts game aired on Sportsnet this regular season. So for the Colts are 0 and 2 on national TV so.. Colts fans won't lose sleep over this. Today's game is also the teddy bear toss so if you will be in attendance, remember to bring teddy bears! The Generals come into Barrie following a 5-3 win last night over the Ottawa 67's. Ottawa had a 2-1 lead following the 1st period but Oshawa came back, out-scoring Ottawa 4-1 in the final 2 periods. Kyle MacLean scored the game winner for the Generals early in the 3rd period, while Brendan Harrogate would put the insurance goal into an empty net in the final minute of regulation. Former Barrie Colts defenceman Matt Brassard scored the other 2 goals for the Generals. Cole Cici got the start for Oshawa and made 33 saves. Oshawa was out-shot 36-29; went 0 for 3 on the power play and killed all 5 penalty kills. 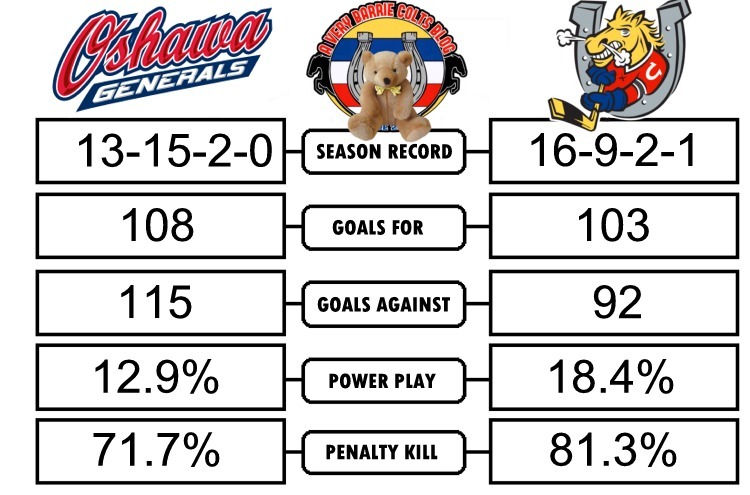 Oshawa currently sits in 5th in the East Division and 7th in the Eastern Conference. The Colts come back to Barrie on the back of a tight 3-2 win over the Mississauga Steelheads. Justin Murray (4th of season) and Zach Magwood (15th of season) both would score early in the 1st period to give the Colts a 2-0 lead. The Trout would come back and tie things up mid-way through the 3rd period. Then, the lights went out. After the power went out, the game restarted with less than 5 minutes remaining in regulation, and Jason Willms, who returned following a hit that caused him to leave the game, would score the game winner (15th of season). Magwood would finish the night with a goal and 2 assists. Leo Lazarev was supposed to start but was a late scratch and Kai Edmonds got the start. He had a great game, making some big saves and ended the night with 32 saves. Barrie allowed 2 goals on 6 penalty kills. The team leads the league in penalty minutes with 416. Oshawa has the 2nd most with 415. Barrie went 0 for 3 on the man advantage. Barrie is 8-5-0-1 at home this season while Oshawa is 6-9-1-0 on the road. Puck drop is scheduled for 3:30 today and the game can be seen across the country on Sportsnet.